I’m going to complain about a rather tasty dinner I made. Yes, complain. Because although Kung Pao Chicken Tacos were tasty, it was an awful lot of prep for 5 minutes of eating dinner. I know that I’m the person who makes her own vanilla extract; who takes the time to make my own bread from scratch, sometimes even if I knead it by hand; who will roast chickens for fun; and who will even take the time to make candy on the stove. But after work, several short and easy steps just seem frustratingly numerous and time-consuming. I particularly don’t like the drudgery of chopping things for dinner after work. Maybe it’s just the weeknight timing that’s frustrated me with this recipe today. Luckily, my time spent produced good food. 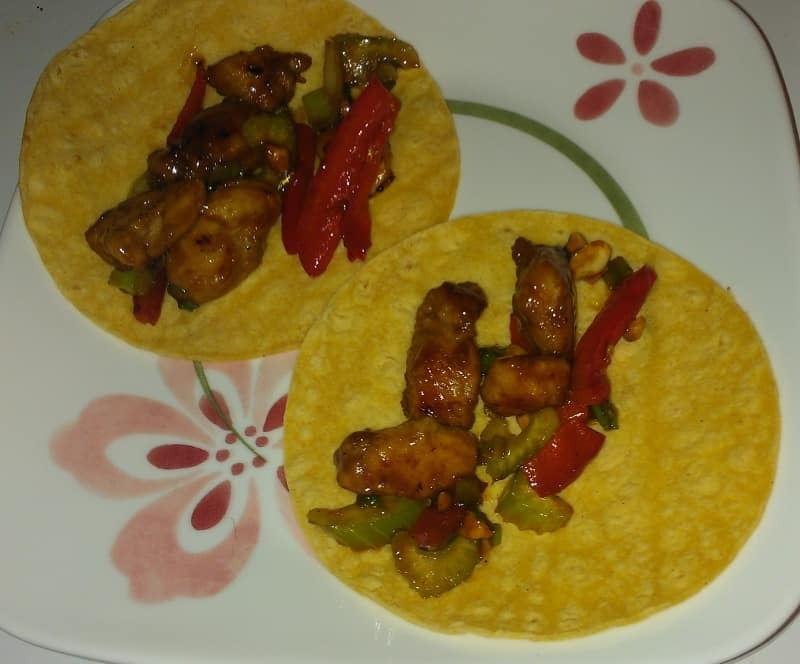 Here’s how I made yummy tacos. I had Alex cut up chicken tenderloins into little bite-sized pieces, then put them in a zipper bag with a little low-sodium soy sauce. While it marinated, I cut up part of a red bell pepper, 2 stalks of celery, some green onions, and some peanuts. I mixed together the ingredients for the kung pao sauce (soy sauce, corn starch, rice vinegar, honey, sesame oil, and Sriracha), but I waited to microwave it until I was ready to use it. After the chicken marinated 30 minutes, I spooned it into some cornstarch and tossed it to coat. I cooked the chicken in batches in a non-stick skillet with some oil. When the second batch was cooking, I microwaved the sauce for 1.5 minutes, stirring halfway through; this thickened it a fair amount, even in my 800 watt microwave, so those with stronger microwaves should beware. Once all the chicken was cooked, I returned the first batch of chicken and the vegetables to the pan and stirfried everything briefly. I stirred in the sauce, mixing well. Alex microwaved some tortillas for us, and we topped them with about the right amount of taco mixture. The tacos were as promised. My first tacos were a little skimpy on the filling, but my second were overflowing; the abundant chicken balanced the corn in the tortillas. The chicken was tasty. The sauce was spicy and sweet and savory, just how I would want it. I’m glad I sauteed the vegetables because it helped the filling meld. But I just can’t get past the fact that it took me 45 minutes to cut up my vegetables, make the sauce, cornstarch the marinated chicken, and cook everything, and that it took me less than 5 minutes to eat the results (and 10 minutes if you count seconds). This was a tasty recipe, and by all means, make it if you have someone to keep you company while you work. Or save it for a weekend meal when you don’t feel like you’re wasting all of your time chopping stuff. Despite my complaints, I may make it again sometime.